Naked Put - What Does It Mean? 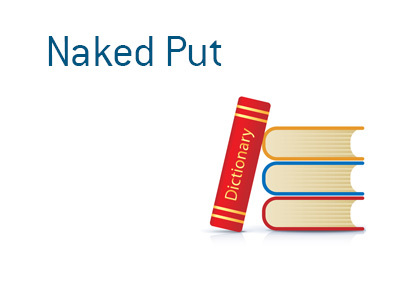 What is the definition of the term "naked put" as it applies to the world of stock trading? What is a "naked put"? In the world of options trading, a "naked put" is when a person, who has no desire to own shares of the underlying stock, sells a put without having any sort of a hedge in place. For instance, let's say that you believe that Zillow (Z) has stopped falling. With the stock currently trading at $30, you decide to sell a put at $27.50 that expires in one month. The premium that you collect for the transaction is $1.00 per option, and you end up selling 10 of the options. This means that you are agreeing to buy 1,000 shares of Zillow at $27.50 by the option expiration date. Of course, the person on the other side of the trade will only exercise their option if the price of Zillow is below $27.50 by that date. Let's say that Zillow misses their earnings and drops to $25 by the option expiration. This means that while you collected $1,000 in premium on the trade, you are now the proud owner of 1,000 shares of Zillow at a price of $27.50. So, you would end up losing $1,500 on the trade. Now, a "cash secured" put can be a clever way to lower your cost basis in a desired stock, provided that you want to own the stock. A "naked put" is a different story and has been known to cause severe losses for even the savviest of trades. Use at your own risk.